I pray that the noble feet of the Sovereign of the Teachings, in their thorough completeness, remain firm. If you are attached to this life, you are not a Dharma practitioner. If you are attached to the Three Realms [of Saṃsāra], you do not have renunciation. If you are attached to your own self-interest, you do not have Enlightenment Mind (bodhicitta). If you engage in grasping, you do not have the View. To the Sublime Yogin of the Great Perfection, I supplicate. Through it, suffering is eliminated and happiness is gained. 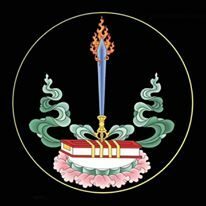 To the Threefold Ḍākinī, Yangchen Lhamo, I deeply bow. Aspire for the cause of giving rise to Discerning Insight. Then, the Bodhisattva Samantabhadra was resting evenly in the Samādhi known as ‘Demonstrating the Non-Conceptuality of All Phenomena’. Through the power of that Samādhi, all the world-systems throughout the universe, equal [in number] to the number of subtle particles in all Buddha Fields, trembled. Thereupon, the Bhagavān touched his head with his hands toward the Bodhisattva Samantabhadra.